Join tarot author and tarot deck creator Sasha Graham for an intimate afternoon discussion of her new book, "Llewellyn&apos;s Complete Book of the Rider Waite Smith Tarot," talk tarot history, how to read tarot instantly (without memorized meanings) and how to create your own deck of tarot cards from idea to publishing. Stay for a Q & A plus a book and deck signing. 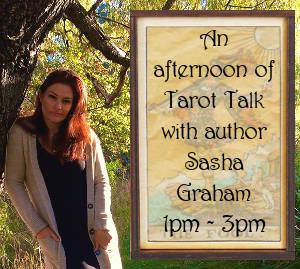 Sasha Graham teaches tarot classes, speaks and lectures around the world. Sasha and her work have been featured on Sirius XM Radio, The New York Times, The New York Post, Inside Edition and she was the first tarot reader to ever be featured in the cover of Crain&apos;s New York Business. Sasha appeared as a regular guest on the WPIX Channel 11 Morning News and wrote a weekly Tarot column for Marie Claire. Sasha partnered with Heyou Media in 2018 to create and host The Enchanted Kitchen, a six-episode short form cooking series for Youtube and Heyou&apos;s Mobile. Mini. Movies, now in season two production. Sasha Graham&apos;s work has been translated into Chinese, Italian, French, Spanish, Polish and Portuguese. She is the author of Llewellyn&apos;s Tarot Diva, 365 Tarot Spreads, 365 Tarot Spells and served as editor and writer of Lo Scarabeo&apos;s Tarot Fundamentals, Tarot Experience and Tarot Compendium. Llewellyn&apos;s Complete Book of the Rider Waite Smith Tarot is her newest offering. The Haunted House Tarot is her first tarot deck with Marvel artist Mirco Pierfederici. Sasha&apos;s second dark and delicious deck with artist Abigail Larson, The Dark Wood Tarot will be released by Llewellyn in 2019. She is a contributing author of Llewellyn's Magical Almanac, 2020.